Over the past 15 000 years, Alpine forests have suffered many trials and tribulations. In their search for wood over the centuries, humans cleared many slopes, damaging both the forests and the mountains themselves. Today, forests are making a come-back. However, this ecosystem so enjoyed by urban dwellers is a source of other problems as well. Forest management is a delicate balance between use of natural resources and preservation. The Italian lumberjacks from the central and Eastern Alps long constituted an excellent source of labour for forestry work. They have since been replaced by Moroccan, Czech and Polish workers who face hard and often precarious working conditions. Marginal, foreboding, yet fascinating figures, charcoal burners and lumberjacks represent another side of forest life that is intriguing, but also somewhat disturbing. The roles they play in folktales are ample proof of that. A look balancing between the picturesque, the sordid and the idealised. Last fall, Czech and Slovak lumberjacks travelled westward for a job on the eastern slopes of the Vercors plateau. Intrigued by their work, Emmanuel Breteau, a photographer from the Trièves, spent several days with them. The result was a wonderful meeting and a poignant story in the shadow of the Mont Aiguille and the snow of an early winter. Rafting for your life ! For centuries, daring navigators travelled the Alpine rivers on their vast rafts of tree trunks, mastering the waterways to bring tons of wood to the cities. A dangerous job requiring a great deal of skill and experience. A glimpse at a little-known forest job. To the sea (with your wood) ! From Nice to Bavaria and from Geneva to the Trentino, all the best addresses to discover Alpine forests and the many job sectors working with wood. The woodworking creativity of Alpine inhabitants is renown worldwide. Examples are furniture and sculpted objects from the Queyras and Aoste valleys. But here and there, it is also possible to uncover some little-known treasures crafted by unusual artists. That is the case of Paulin Gilly, in the Ubaye valley. 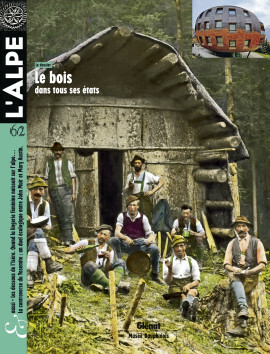 The lifestyle of Alpine inhabitants expresses itself in woodworking. Since time immemorial, it has been an indispensable material, slipping from the outdoors into homes and farms, making possible fascinating activities where skill and know-how slowly accumulated to produce creativity. From sausage funnels to high-tech speakers that literally make wood sing, a selection of the many possibilities. Was lingerie created in the Alps ? 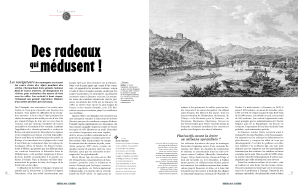 Building on its strong textile industry, the region pioneered the sector with brands such as Valisère and Lou. The exhibition at the Musée Dauphinois, Isère undercover, reveals a century of underwear manufacture. A long story about fashion and women, but also a collective and industrial adventure. Toward the end of the 1800s, shepherds from the Alps watched over great herds of sheep in the West of the United States. They become involved nolens volens in an ecological-political-philosophical duel between writers John Muir and Mary Austin. A debate of ideas that continues to this day. Barbed wire on the prairie ? The Flock. The book by Mary Austin recounts the daily life of shepherds, most of them from the Alps, with whom the author shared the transhumance in the Sierra Nevada. Passionate about man’s relationship with nature, she advocated in favour of a lifestyle that was severely threatened at the time. A never-published excerpt from the French edition still being translated.